No matter how hard we may wish it away, one chore that will always need to be done is cleaning. But there’s no reason we can’t at least make cleaning a little more enjoyable. I’m sure you, along with many other moms you know, think what’s in (or not in) household products is important. I mean nobody would purposely subject family members to potentially harmful chemicals! The fact is most of the time people just don’t know what’s in their cleaners. If you’ve been a reader of Saving by Design for a while, you probably know I love mixing up my own DIY natural household cleaners. 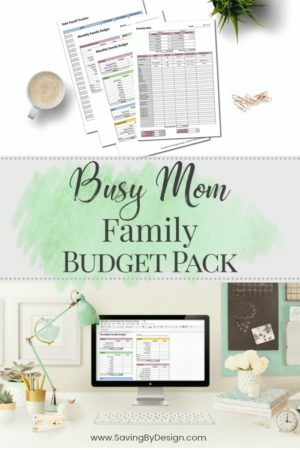 However with a baby in the house sometimes I just can’t find the time to get everything done that I’d like to. That’s why it’s wonderful to have a place that sells fantastic, non-­toxic products which smell amazing as a backup. For me that place is Grove Collaborative. 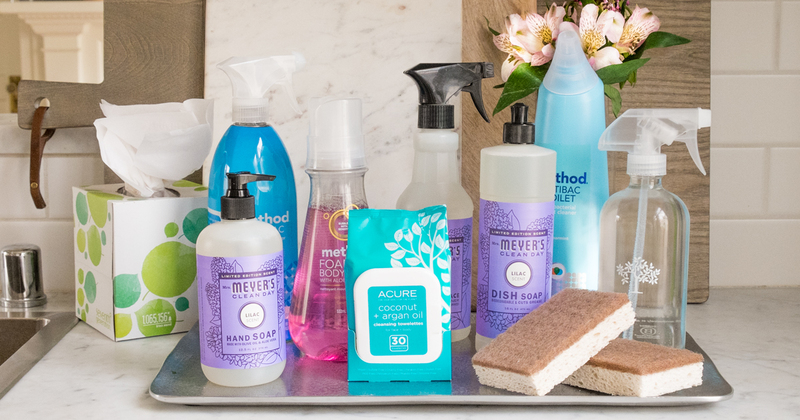 Keep reading to find out how you can get these amazing cleaners to give as a gift for free! Instead of just giving more “stuff” as gifts for holidays and special occasions, I try to give gifts that will not only be loved, but that will also be used. 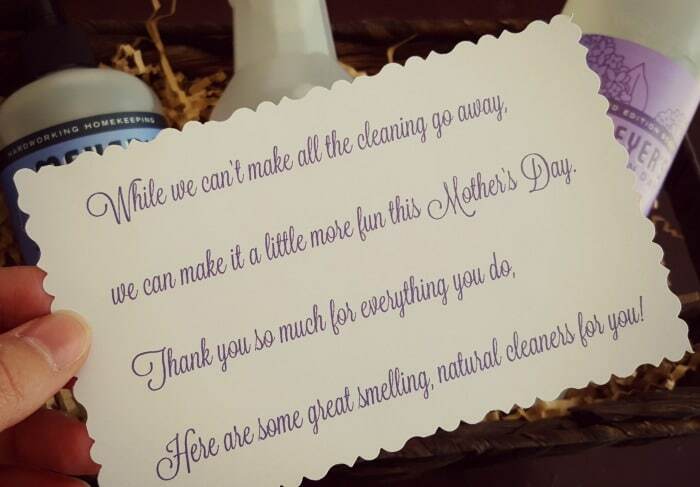 Last Mother’s Day I came up with the idea to share my favorite natural cleaners with our moms. I made this Mrs. Meyer’s Mother’s Day gift basket by packaging everything a nice basket complete with a cute poem (I used scrapbook scissors to cut that pretty scalloped edge). They absolutely LOVED their gift! Here’s that poem for you to print. Grove Collaborative is an online store that delivers the best, effective and affordable natural household and personal care products right to your doorstep. 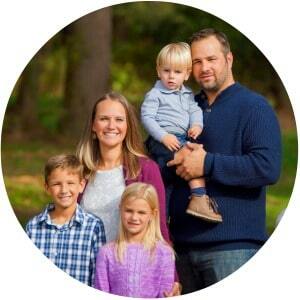 I’m a huge fan of Grove because they make having a healthy, beautiful home easy. I don’t have to worry about running out of toilet paper or rushing to the grocery store to buy over­priced laundry detergent with ingredients I can’t pronounce because Grove always has me covered. I also love that shipments are totally customizable and on a flexible schedule. You can make changes, cancel, or rush a shipment at any time. Should you choose to cancel (I don’t think you will 🙂 ), you can do so at any time without any fees or hassles. Just clear out your basket to stop receiving deliveries, or contact Grove if you’d like help. If you are a new customer to Grove Collaborative, they have a great deal for you! 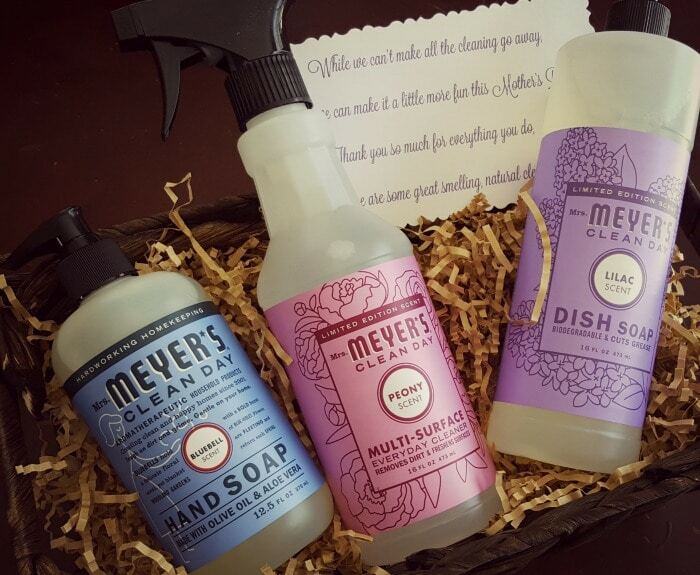 You can get a free Mrs. Meyer’s hand soap along with a $10 credit! This makes your Mother’s Day gift basket items free! Sign up for Grove Collaborative here. You will receive a Mrs. Meyer’s hand soap for free and a $10 credit to use on the products of your choice when you sign up! 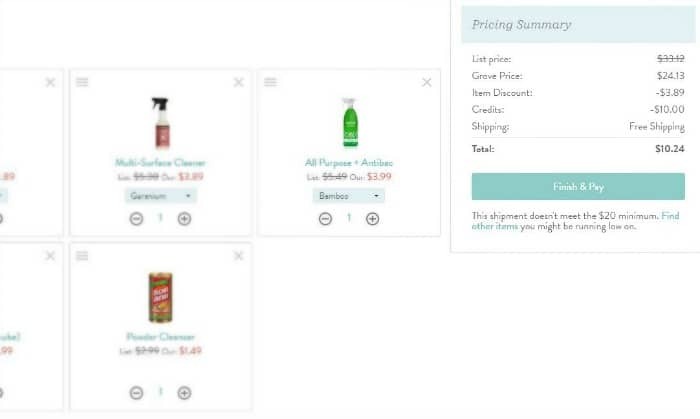 Once you’ve answered the questions, you can finalize your basket of products to suit your household needs by adding or removing items. Be sure to add the products you’ll need for your Mother’s Day gift basket! To make your gift even better, the limited edition spring scents are now available! In addition to the usual variety of scents, Peony and Lilac will also be available for a limited time. I’m sure the moms on your list would be delighted to be introduced to these hard-working, heavenly scented natural cleaners too! > DIY Natural Air Freshener – Only 2 Ingredients Needed!